August | 2013 | The Loudest Librarian! This is one of the best picture book adaptations of a children’s song I know. 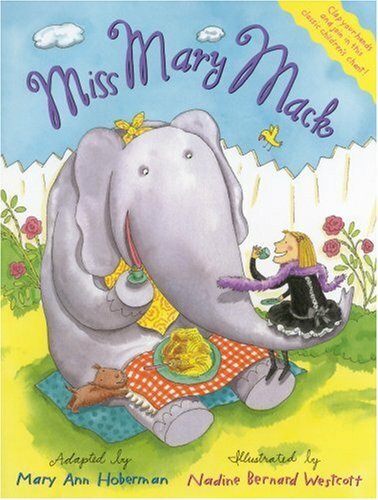 It extends the clapping rhyme story about Miss Mary Mack and the elephant who jumped the fence. The song is catchy, the illustrations are hilarious, and it works for almost any age. I had the kids pat the rhythm as I read, and afterwards a brave Mom helped me demonstrate the clapping rhyme (since I have the coordination of a drunken tree sloth, I found it a bit challenging, but it was fun). Wilhelmina Harper was a librarian in Redwood City, California. I wish I knew more about her, because this is one of my all-time favorite read-alouds. 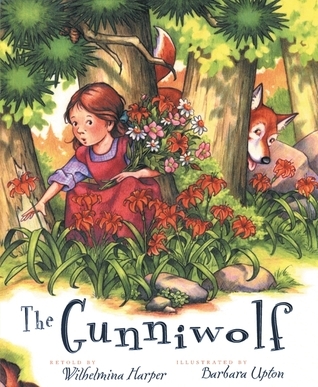 It’s essentially a less grim version of Little Red Riding Hood, where a little girl disobeys her mother by going into the jungle, and runs into the dreaded Gunniwolf. Thankfully, nobody gets eaten or chopped up with an ax, but the language of the story is unforgettable: the Pit Pat, Pitty Pat of the little girl running, mixed with the Hunker-CHA! Hunker-CHA! of the pursuing Gunniwolf. Plus there’s an eerie song that goes, “Kum-kwa-khi-wa, kum-kwa-khi-wa.” I have a soft spot for the original version, with illustrations by William Wiesner, but this version is bright and colorful, and the Gunniwolf looks more like a big friendly dog, which makes it less scary. Some of the kids sat mesmerized while a couple were frightened, and several of them wanted to check it out at the end. 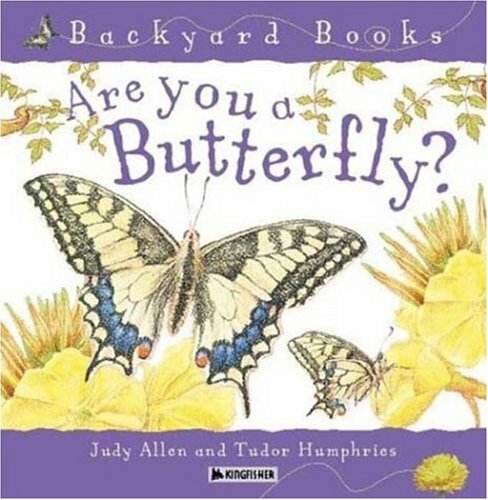 I don’t know how many times I’ve read this book to my own kids, who have both loved it since toddlerhood. 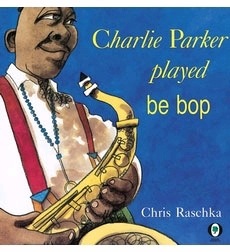 It’s a sound poem about Charlie Parker, the legendary jazz saxophone player, and it’s a blast to read, with lines like “Be bop. Fisk, fisk. Bus stop. Zznnzznn” and my kids’ favorite: “Never leave your cat alone.” It’s based on Parker’s performance of A Night in Tunisia, and I try to convey some of the melody of that song when I read it. It’s a wonderful way to introduce the idea and spirit of jazz music. 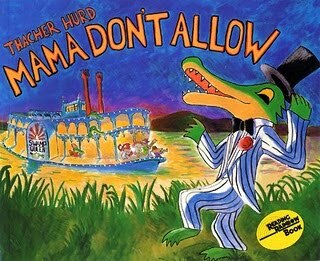 No one in town wants to hear Miles and his Swamp Band perform, except for the sharp-toothed alligators who ask them to play on their riverboat. When the band learns that they are on the dinner menu, they have to use their wits and their music to escape. I love the colorful illustrations and the humor of this book, and it was quickly snapped up for check out at the end. I usually follow this one with the song “Mama Don’t Allow” and ask the kids to suggest things their Mom’s don’t let them do, which is always entertaining. Another one of my long-time favorites, this is the story of a lizard who likes to make up songs. He is happy singing about his home on the rock until Bear decides he wants Lizard’s song too. The kids usually join in on the simple “zoli zoli” song. INSTRUMENT PLAY WITH A CD: Little Liza Jane by Elizabeth Mitchell from her You Are My Little Bird album. Rhythmic and catchy. I gave each child two paper plates and some rice and/or beans to put in the middle. 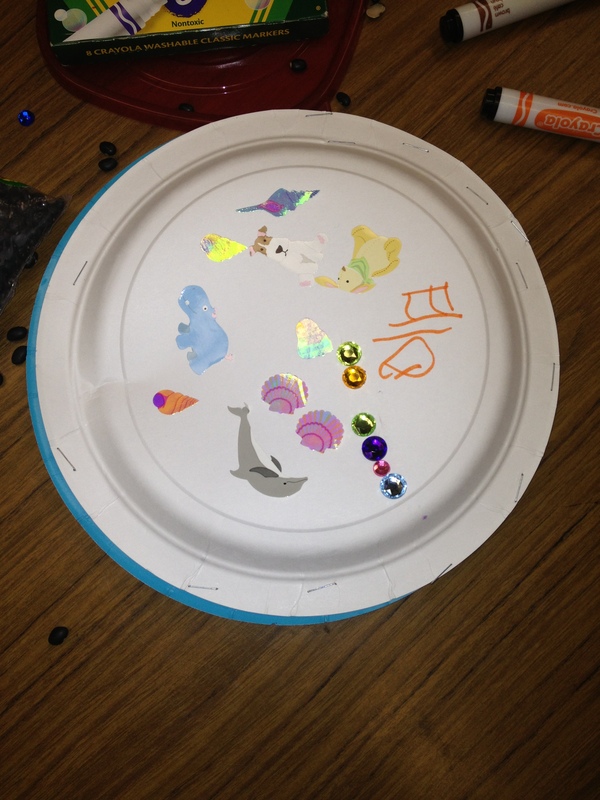 The parents helped staple the plates together, and the kids decorated the outsides of their new instruments with stickers, gems, and crayons. There was some little trails of rice leading out the door of the library that night, so I think next time I’ll just go with the beans, but it’s always fun to give the kids free-rein on how to decorate something, because each instrument was so different from the others. One that I wish I had been able to read/sing tonight was Iza Trapani’s How Much Is that Doggie in the Window? It’s one of my favorites, although I’m embarrassed to admit I sometimes get choked up at the end (I’m a terrible sucker for a happy ending). In this variation of the song by Bob Merrill, a little boy tries to save up to buy a puppy from a local pet shop, but ends up spending all his money to help his family instead. What are your favorite books about music and songs? For the past few years, I’ve been lucky enough to know a wonderful group of parents and kids who meet for dinner every Wednesday night, then come to the library for my Family Storytime. Most of those kids will be starting Kindergarten next week, and to me it feels almost as bittersweet as it did when my own son started school. The little group has become like a second family, and I’ve enjoyed seeing the kids each week as they fight like siblings over who is going to get to check out the book I just read (or am about to read), suggest wild new original verses for songs, and glue dozens of googly eyes to whatever craft project we’re doing. It’s been so much fun to see them get taller, and more expressive, and skilled with crayons and glue sticks and scissors. They are definitely ready for Kindergarten, and I’m excited for them. But I know life gets much busier once kids go to Kindergarten, especially with homework and class projects and after school activities. So I hope they’ll keep coming on Wednesday nights, but I know it may be hard. My coworker Gail B., who runs our library knitting group, showed me this one. 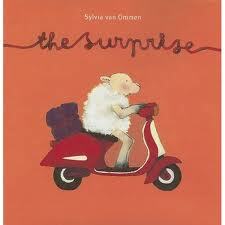 It’s an adorable wordless picture book about a sheep who measures her own wool, drives to the store on her motor scooter for some dye, dyes herself red, shears off her wool and takes it to a very French poodle to be spun into yarn. And then she knits a surprise. One of the Moms commented that she wished more books were about crocheting rather than knitting (there are quite a few knitting books now including The Red Wolf by Margaret and Extra Yarn by Mac Barnett and Jon Klassen). So children’s authors and publishers, take note! The kids loved this Charlie and Lola story, where Charlie explains why Lola needs to go to school to learn how to count (in case eleven elephants want a treat), write letters (so Santa Claus’ elves don’t get her Christmas wishes mixed up), and read (in case a very angry ogre demands to have his favorite bedtime story read aloud). The kids especially enjoyed the pages that featured Soren Lorenson, Lola’s invisible friend, who appears ever-so-faintly in the pictures. 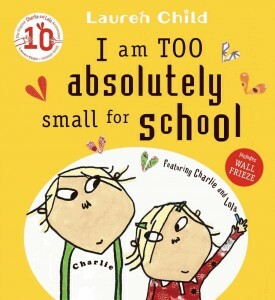 A fun read-aloud about all the worries kids might have about starting school. 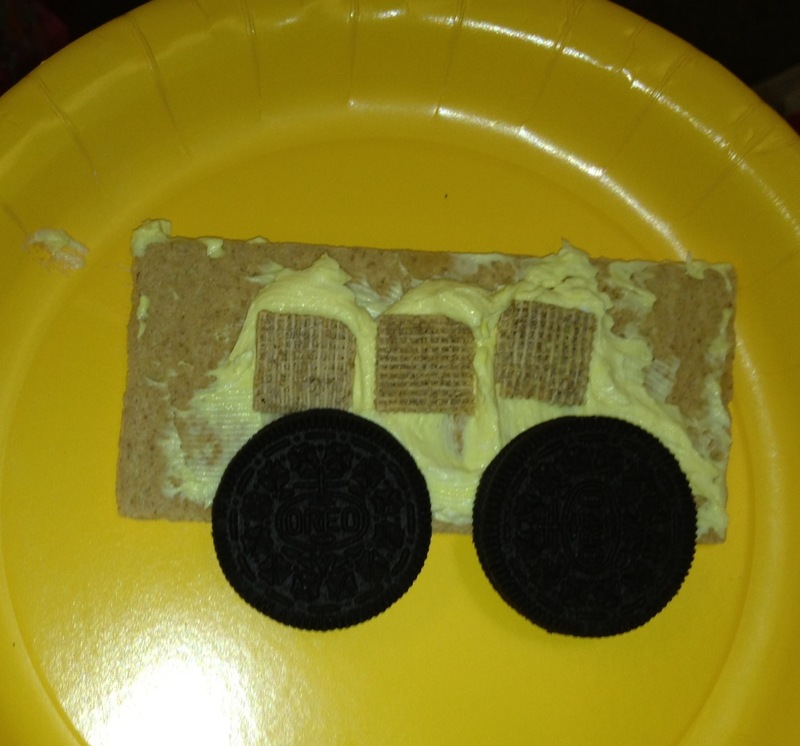 Okay, so this one wasn’t actually a school story either, but I had a couple of toddlers in the audience, and my craft was about buses. Hilarious version of The Wheels on the Bus, about a bus full of animals. 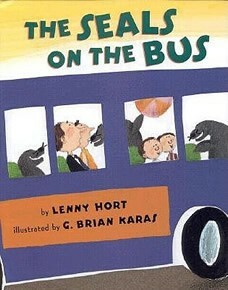 My favorite are the “vipers on the bus” that go “Hiss Hiss Hiss.” Buh-dum-bum. I actually read this one again this morning for a toddler storytime, and one little boy was so fond of it that he cried every time his caregiver put it down. 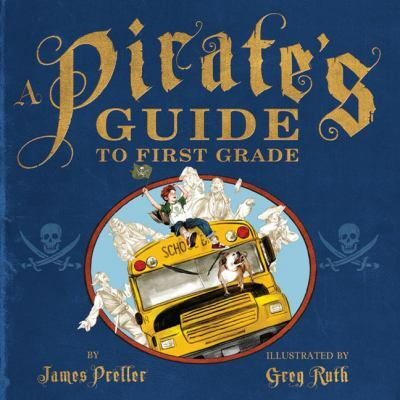 This book is written entirely in “pirate,” which makes it fun to read aloud, and perfect for Talk Like a Pirate Day (September 19!). The illustrations show a boy going about all the usual routine of the first day of school, except that he is accompanied every where he goes by faint line drawings of pirates (his invisible crew), and he talks like a pirate. Librarians will appreciate that the “treasure” he finds at the end is the book Treasure Island. Twinkle Twinkle/ABCD: These were by request. After we sang Twinkle Twinkle and ABCD, one of the kids suggested that we hum the song, so we did. Then we quacked it like a flock of noisy ducks. Great fun. Baby Bumblebee: I had a big bumblebee puppet, so we actually sang “I’m bringing home a giant bumblebee,” and then I “stung” all the kids with the puppet. After that, I asked the kids for suggestions (it’s always a fun challenge to come up with a rhyme on the spot). We brought home a baby giraffe (“won’t my Mommy really start to laugh”); a crocodile (“won’t my Mommy cry for quite a while”); a bunny (“won’t my Mommy really think that’s funny”) and, the stumper, a baby person (“won’t my Mommy think that’s worse and worsen” –best I could do). Skip To My Lou by John McCutcheon from 20 Great Kids Songs. Great, lively version of this traditional song, where McCutcheon presents some of his own verses like “There’s a hole in the doughnut and a fly flew through.” This is one of my favorite albums for kids. 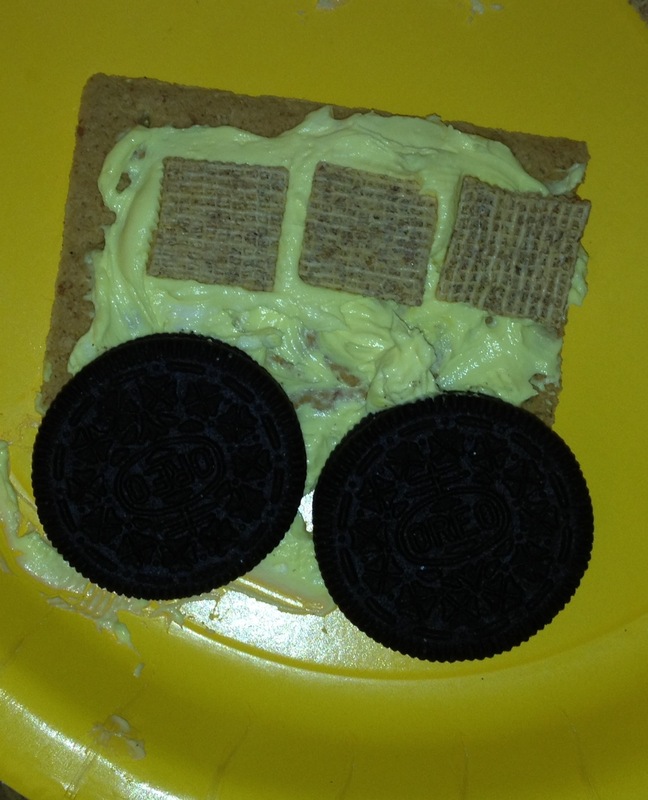 I added yellow food coloring to some whipped cream cheese in advance, then gave each kids a plate with a graham cracker, 2 Oreo cookie “wheels,” square cereal pieces for windows, a dollop of yellow cream cheese and a plastic knife. It was quick to assemble, and surprisingly not terribly messy. I think a number of the buses didn’t made it out of the station. 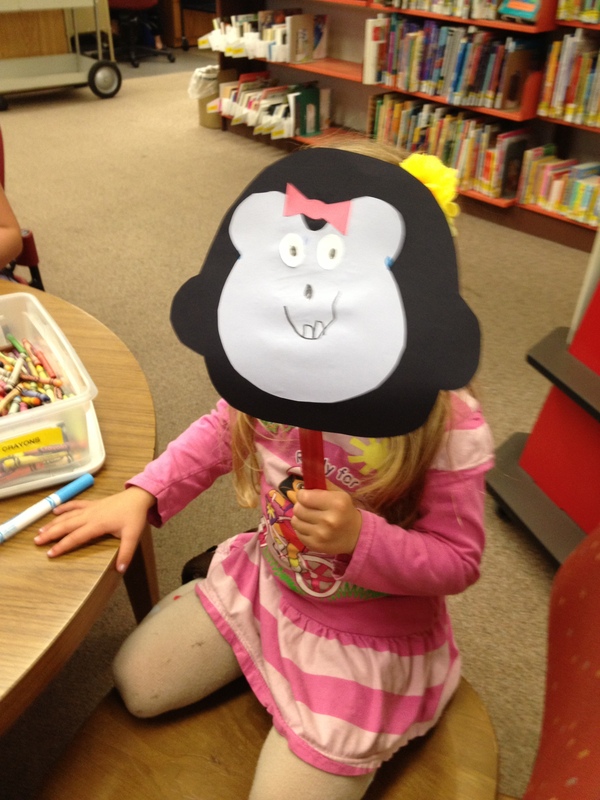 This craft appears on a number of websites, including Juggling With Kids, where they made it to accompany a Mo Willems book reading event (they added the pigeon from the Don’t Let the Pigeon Drive the Bus series). Cute story about a panda who is nervous about starting Kindergarten until his parents are allowed to stay with him for the first day. They all have a wonderful time, singing songs and painting and making things. The next day, Tom goes off happily to school on his own, but now his Mom and Dad are sad they aren’t allowed to go to Kindergarten too. This is such a classic. It has everything: drama, mystery, and a larger-than-life villain, Miss Viola Swamp. I love that the book gives just enough clues for the kids to figure out what really happened to Miss Nelson without stating it outright. I once read that James Marshall loved to draw as a kid, but stopped when a horrible teacher in elementary school made fun of his artwork. He gave up drawing altogether until he was an adult, and that teacher became the basis for Miss Viola Swamp. That story makes me incredibly sad because among my favorite books as a child were Marshall’s George and Martha series, and I hate to think that the world could have lost out of those altogether because of the nasty comments of one person. I tell Marshall’s story to my son a lot to remind him never to give up doing the things he loves, no matter what anyone else says. This one was written by a local librarian, and, while it’s not actually set in school, the heroine of the story gets to act like a teacher. When Becky stays home sick from school, her two grandmothers come to take care of her. The trouble is that they have very different ideas about the proper things for a sick girl to eat and drink, and they argue all the time. Becky tells them that they are acting like they are in preschool, and teaches them the rules for taking turns and sharing she knows from Kindergarten. It’s an adorable, funny story that would also work well for a storytime about grandparents. What are your favorite books about going to school? Last night we read stories about numbers and counting. I’m embarrassed to say that I originally chose this theme because of the book Five Little Monkeys Play Hide and Seek by Eileen Christelow, which my daughter absolutely loved. It’s my favorite of the Five Little Monkeys series (with Don’t Wake Up Mama as a close second), and it features the five monkeys tricking their babysitter by hiding in the one place she would never think to look–in bed. It also has lots of counting to different numbers, even 104 (I probably wouldn’t go that high for storytime, unless the group seemed really into it). Anyway, in the end I went off to work and left the book beside my daughter’s bed–one of the perils of being both a children’s librarian and a mom. 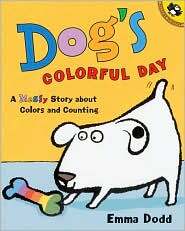 This simple board book involves counting dogs from 1 to 10, adding in a new doggie sound each time. Even though it’s meant for toddlers, it works well for almost any age because the kids love joining in on the various barks and whines. It made for a great opening book tonight. 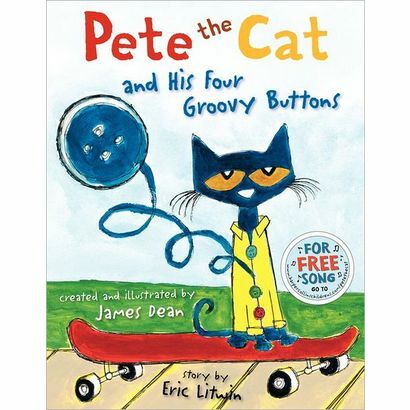 My second favorite Pete the Cat book (after I Love My White Shoes). In this one Pete keeps losing his groovy buttons, but does he cry? Goodness no! The kids liked the clever twist at the end, when Pete discovers he still has a button, even after all the ones on his shirt have rolled away. Always a hit. I was glad I had this book in the mix because there were several elementary school aged kids in the group, and the other books I had were primarily for younger children. This is the sequel to Otoshi’s One, a powerful but remarkably simple picture book about bullying, with the message that everyone counts. 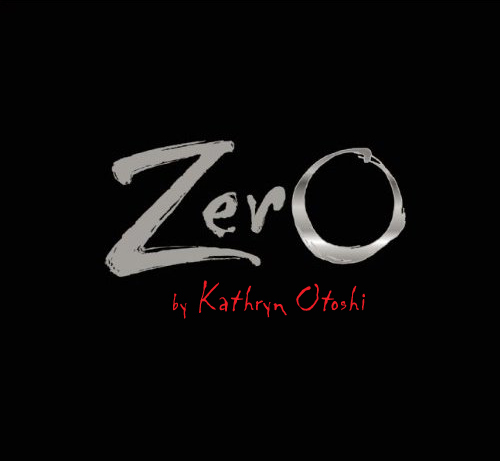 In Zero, the number zero worries that she has no value, until she realizes that if she works together with her friends, they can count to much higher numbers than they ever had before. Like One, this book works on multiple levels. A simple, vibrant counting story about a dog who gets covered in spots of different colors (orange juice, jam, mud) etc., throughout the day. The kids get lots of opportunities to count and name the colors. This one works really well as a flannel board. B-I-N-G-O: To go along with the book Doggies, we barked the missing letters instead of clapping them. I asked the kids to suggest different types of dogs for each verse, which got interesting. We had a poodle (“oui, oui! woof woof!”), a puppy, a big dog, and a cat dog (meowff?!). INSTRUMENT PLAY WITH A CD: Down Down Baby by Laurie Berkner from her Whaddaya Think of That album. To go along with Dog’s Colorful Day, I printed out a dog picture from Coloring Pages for Kids (in the process, I found this wonderful storytime web site called Public Library Program Ideas, which had suggested this activity as part of a Spots and Stripes theme. 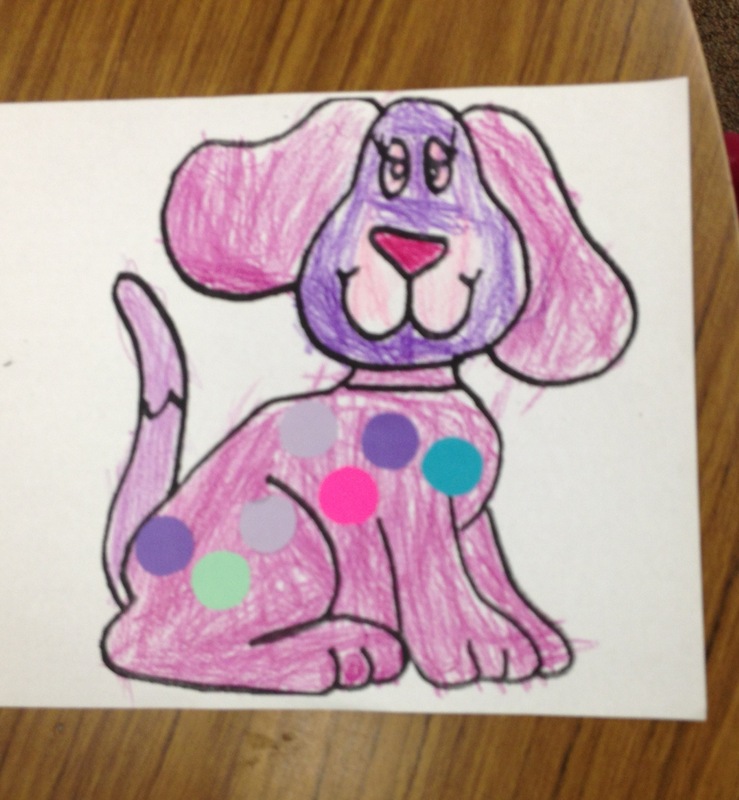 The kids colored in the dog with crayons and then glued dots of different colors on it. A new book I just discovered and absolutely LOVE is The Boy Who Loved Math by Deborah Heiligman and LeUyen Pham. It describes the life of Paul Erdos, a Hungarian mathematician, who from early childhood had an astounding talent for and interest in math. Like many geniuses, he was a bit eccentric. For instance, until he was 21, he had never buttered his own bread (his mother and his nurse had always done everything for him). The book briefly touches on prime numbers and negative numbers, not in depth, but enough to pique the interest of young math enthusiasts. It’s an exuberant, fun, fascinating story, and it’s clear that the author loves math as much as Erdos did. An excellent biography, especially for elementary school kids. I’m looking forward to using it for class visits. Any other favorite counting and number books? 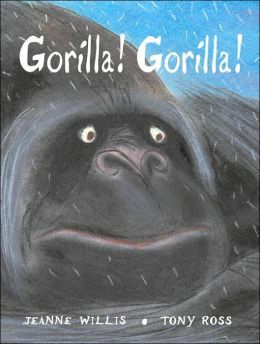 One of my all-time favorite books for toddlers, this is a sweet story about a little gorilla, and all the animals who love him. But then one day he begins to grow and grow and GROW, until one day he is big. And everybody still loves him. I have the kids sing Happy Birthday to Little Gorilla on the page with his birthday cake. This book seems to appeal to a wide range of ages, and is perfect for storytimes about birthdays and jungle animals. Even though the color scheme is very 1970’s, this book is timeless, and is always a hit. This one was new to me, but it worked really well. Amelia and Nilson the gorilla do everything together, but sometimes the smallest things make Nilson upset. Amelia has to remind him not to have “fits,” especially when they are out running errands with Mom. But when the ice cream vendor runs out of banana ice cream, it is Nilson who helps Amelia remember to stay calm. 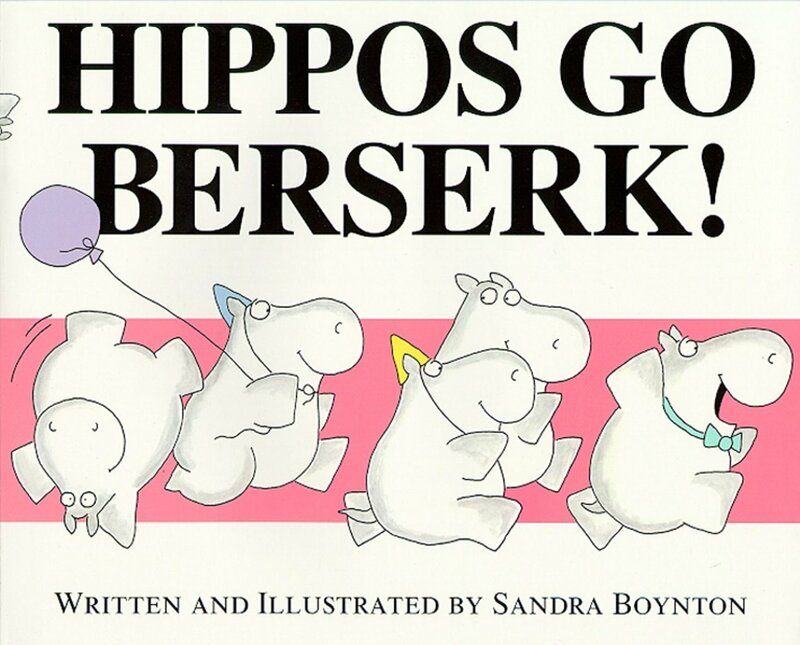 This was a fun read-aloud that gave the kids the chance to join in on the angry “Gaarrrghhs!” when Nilson has his fits. On the last page, Nilson is revealed to be a toy gorilla, a surprise that the kids enjoyed. This book would pair well with Llama Llama Mad at Mama by Anna Dewdney, or Mouse Was Mad by Linda Urban and Henry Cole for other stories about coping with anger and life’s daily frustrations. 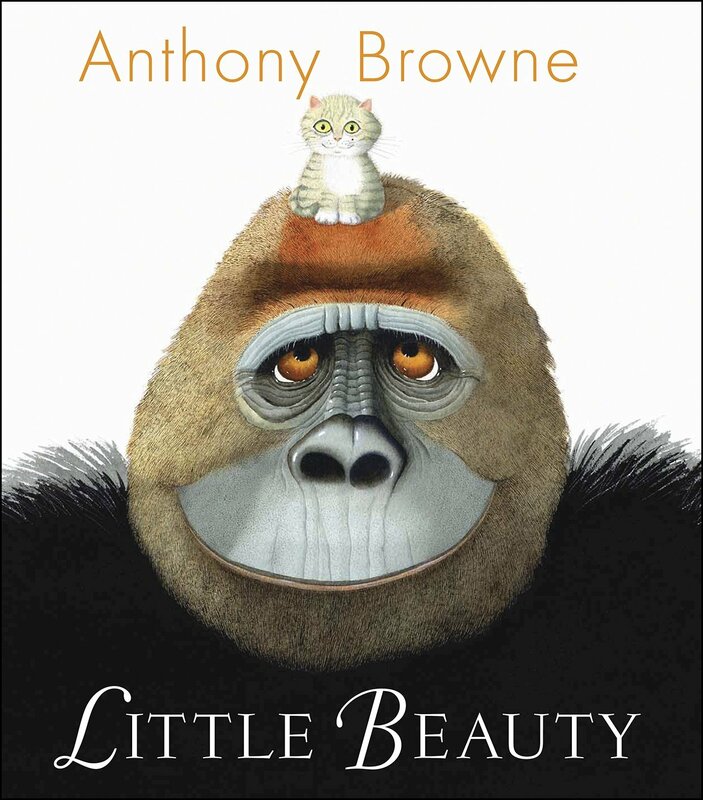 Anthony Browne clearly likes gorillas (in fact, I almost read his book One Gorilla, a counting book about primates). This story is about a signing gorilla, who is given an adorable pet kitten named Beauty. The two become inseparable (the favorite page for the kids, of course, is of the gorilla on the potty, while the kitten sits next to him in her litter box). Then one day the gorilla sees a movie (King Kong) that makes him so angry that he smashes the TV, and the keepers threaten to take Beauty away. But Beauty surprises them all with a sign language of her own. The ending is a bit wacky, but the large illustrations are wonderful, and it was fun to talk to the kids about Koko the Gorilla, who lives in Woodside, not too far from here. I wish I had thought to show them one of the books about Koko and her kittens. A lovely one is Koko-Love! 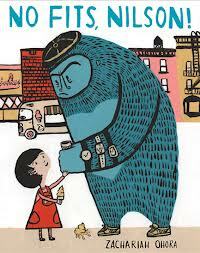 Conversations with a Signing Gorilla by Francine Patterson. Although I love the original version of this song by Elizabeth Cotten, I use the more kid-friendly one by Elizabeth Mitchell and ask the kids for suggestions of where to go. Luckily one of them wanted to go to the zoo, which worked perfectly for my theme. I make a wish and blow them out. I asked the kids how old they were, and we did the rhyme a few times with different ages. I even asked the parents if they wanted their ages represented, but sadly nobody volunteered. There’s a great big gorilla washing his clothes. And a scrubba dubba here. That’s the way he washes his underwear! I got this craft from a site called Noah’s Ark Preschool. There wasn’t a template, but it was pretty easy to draw the faces and heads freehand on construction paper. I cut out those and the eyes (white circles) and bows ahead of time. The kids glued the faces and eyes on and drew in their own mouths, pupils, and eyelashes. We used tape to hold the popsicle sticks on the back. It was amazing to see how different each child’s gorilla was. The book I wish I had gotten in time was Goodnight, Gorilla by Peggy Rathmann, the classic nearly-wordless story about a naughty gorilla who follows the zookeeper around on his evening rounds and lets the animals out one by one. My son and I always enjoyed looking for the mouse and the balloon on every page. Another one I almost read was My Friend Gorilla by Atsuko Morozumi. 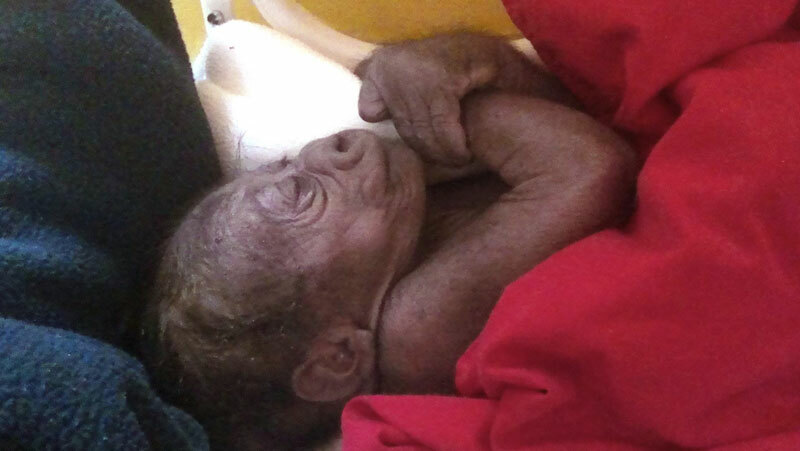 This is a bittersweet story about a little boy whose family takes in a gorilla. They have a wonderful time together, until some people come to take the gorilla away to a preserve where he will be happier. I remember reading this to my son when he was little, and he was sad that the gorilla had to go away, which made for an interesting discussion about animals in the wild versus in captivity. I had also considered doing books about other primates, which might have included Caps for Sale by Esphyr Slobodkina (always a hit! ), but also the more recent Me, Jane by Patrick McDonnell, a lovely simple story about the childhood of Jane Goodall. 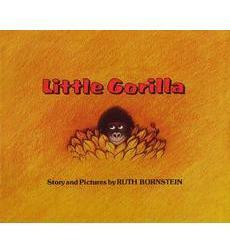 Any other favorite gorilla or ape books? So, with that in mind, here was my storytime. I was surprised last night because, along with my regular kids, who are rapidly approaching Kindergarten, I had one VERY young toddler and three MUCH older kids–they looked to be 9 or 10 year olds. I tried to incorporate a range of books to accommodate them all, but it was tricky. This is one of those bizarrely original stories that stick in your head. 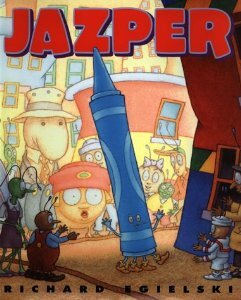 When Jazper (who is some kind of green insect) learns that his father has been injured in his job at the tomato plant, he offers to take a job of his own until his dad gets back on his feet. He ends up working as a housecleaner for five moths, whose house is filled with books of magic tricks. Jazper uses the books to create his own astounding magic act, until the angry moths come after him. Filled with bright, quirky illustrations of Bugtown, this one had the kids mesmerized. Itsy Bitsy Spider by Iza Trapani We sang “The Itsy Bitsy Spider” before I read this book, and one of the older kids said, “Did you know there’s more to the song?” I asked him how the next part went, and to my surprise, he started singing the next verse from this book. So go, Iza Trapani! Your additional verses are catching on. This really is a lovely book, with wonderful illustrations. 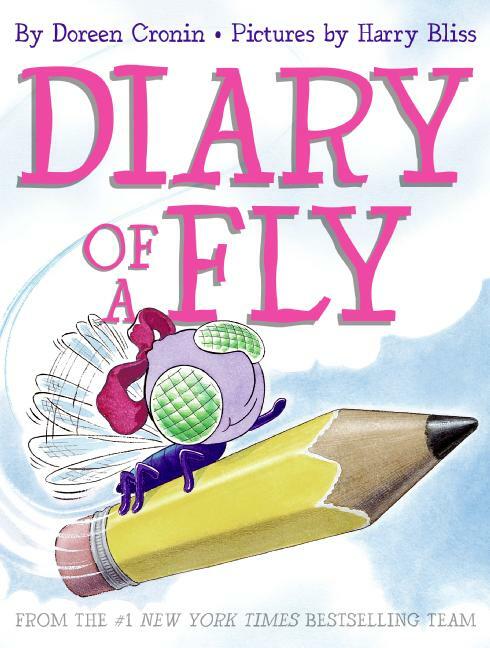 Diary of a Fly by Doreen Cronin and Harry Bliss The kids fought over who would get to take this one home. Most of them knew the series already, but the books are always a hit, even though some of the humor goes over the heads of the younger ones. The part about eating “regurgitated food” got a gratifyingly number of “yucks!,” once I explained what it meant, and it really does teach a lot about flies while being very silly and entertaining. My favorite nonfiction series for preschoolers, these books teach amazing facts about different creatures in an easy, accessible, story-like format with great illustrations. Watch and you’ll see them come out of the hive. I didn’t get around to it last night, but if I had had time, I would have done “Bringing Home a Baby Bumblebee” (I like to have the kids suggest other animals they would like to bring home, and we make up rhymes like, “I’m bringing home a baby li-on. Won’t my mother really start a-cryin'”). INSTRUMENT PLAYALONG WITH A CD: Under a Shady Tree by Laurie Berkner, from her Under a Shady Tree album. 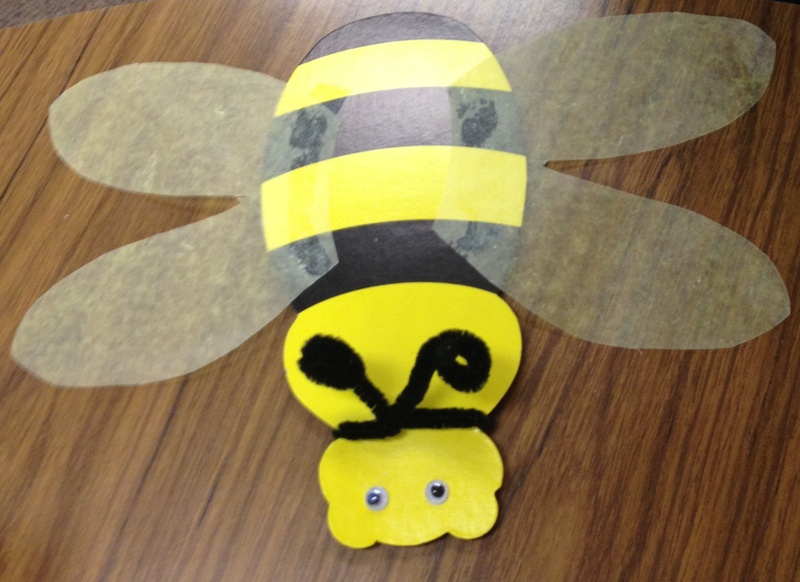 The craft set I had used the tissue paper wings and card stock bee bodies already cut out, so the kids just had to glue on the eyes and wings, and add the pipe cleaner antenna. I was originally planning to do this, much simpler version, where the bodies are made out of construction paper loops: http://lizziejanebaby.blogspot.com/2012/06/20-bug-crafts-to-make.html Incidentally, this site has LOTS of great bug crafts. I did a spider storytime not too long ago, but one of my absolute favorite books is Aarrgghh! Spider! 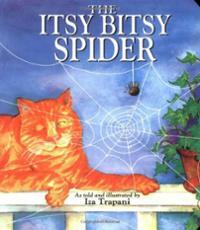 by Lydia Monks, about a spider who wants to be a family pet. What are your favorite insect and spider books?